Extend your UC benefits with Communications-Enabled Business Processes (CEBP) - take the powerful communication and collaboration capabilities of UC and join them with your critical business processes and applications to create new levels of efficiency across your organization. We invite you to preview this AT&T Unified Communication Newsletter. It includes three short case studies that show how organizations are already experiencing the advantages of UC and CEBP today. 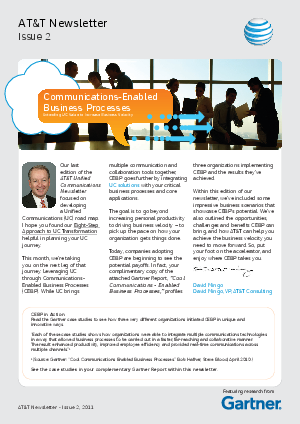 Further, see what analysts have to say about CEBP in the complimentary Gartner Report, "Cool Communications-Enabled Business Processes," included in the newsletter.